Motorcyclist Crashes And Makes Spectacular Landing, MUST WATCH. To all of those that don’t believe that miracles happen, watch this video. It played out like something you would see in an action movie. A motorcyclist crashing at high speeds into a car and then just flipping on to the roof. In all reality it should never really happen that way in real life, but it did. To crash into a car on the freeway while on a motorcycle and still be alive to talk about it is a miracle enough. Let alone the insane amount of perfect physics that made something like this possible. The video was captured by a dashcam on July 30 and was posted on YouTube with no description by a user named Kruszon1984. 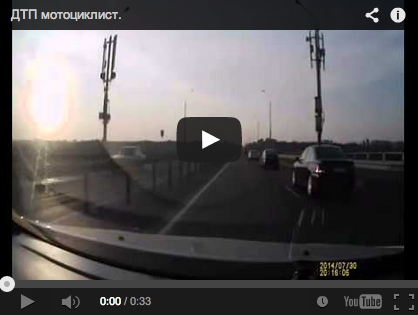 According to LiveLeak, the incident happened in Mahilyow, Belarus. Either way this rider is extremely lucky and if he didn’t think that someone was looking out for him now then he should probably think twice. Then again, knowing the internet, this might just be the next viral video hoax. Who knows, either way I think it’s extraordinary. Must See: “Frozen Fever” – Dueling Piano Siblings Play The Piano Backwards!